Tan Sri T. Ananda Krishnan - the majority shareholder of Maxis, is a strict, no-nonsense man. He has had a good relationship with the minority shareholders of Maxis. Can you now imagine his anger at being entangled with a tarnished auditing firm like PwC? Letter from the General Counsel of Maxis, Mr Stephen Mead. Received from a Maxis insider. Tan Sri Zarinah blames PwC for her predicament. 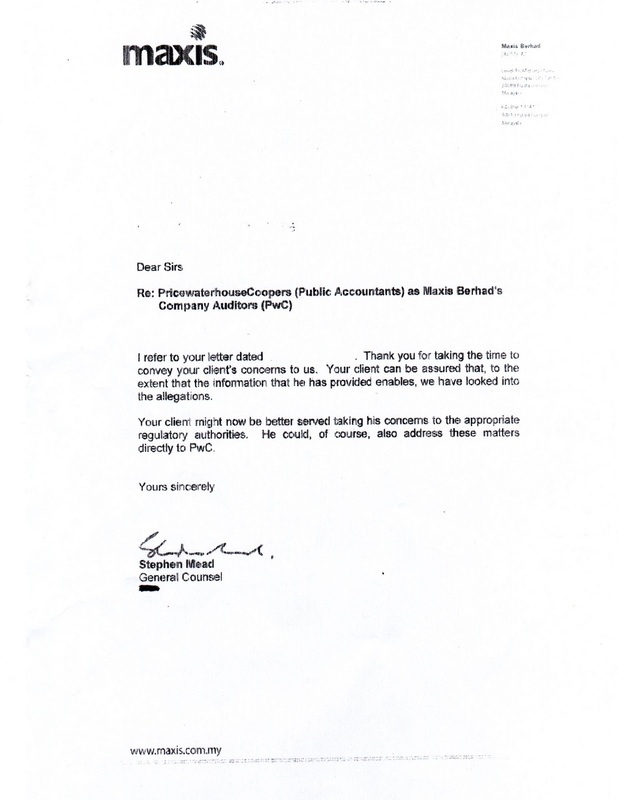 Mr Stephen Mead should ask the following questions of Mr VU Kumar, who is the signing partner in PwC for Maxis, as well as a member of the Disciplinary Council in the Malaysian Institute of Accountants (MIA), and see what sort of answers Mr VU Kumar will give in reply, if he does indeed reply at all. 1. In 2002 IBM Corp acquired PwC Consulting worldwide, which must include PricewaterhouseCoopers Consulting Sdn Bhd (464379-U), the consulting arm of PricewaterhouseCoopers in Malaysia. How is it that Dato' Ahmad Johan bin Mohammad Raslan and Lee Tuck Heng remain as shareholders of PricewaterhouseCoopers Consulting Sdn Bhd (464379-U),which should be under the Global Business Services division of IBM? 2. 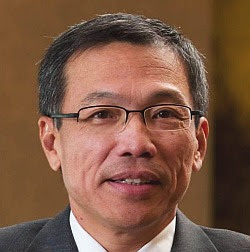 How is it that Chin Kwai Fatt remains as a Director of PricewaterhouseCoopers Consulting Sdn Bhd (464379-U), which should be under the Global Business Services division of IBM, when PricewaterhouseCoopers is the Auditor for IBM Malaysia Sdn Bhd? 3. How has PwC Malaysia managed to keep the regulators from scrutinizing this 9 year old ongoing fraud, where several hundred million Ringgit in contingent liabilities is kept hidden in PricewaterhouseCoopers Consulting Sdn Bhd (464379-U)? 4.How is the renaming of PricewaterhouseCoopers Consulting (East Asia) Sdn Bhd, to PwC Consulting Sdn Bhd (289801-A), and its subsequent sale to IBM valid, when the contingent liabilities were kept hidden in the real consulting arm of PwC in Malaysia, namely PricewaterhouseCoopers Consulting Sdn Bhd (464379-U)? 5. What questions has VU Kumar raised to his fellow senior partners with regards to the appointments of 'sham Directors" to PwC Consulting Sdn Bhd (289801-A), when these "Directors" have never been involved in the PwC consulting business at any point in time? 6. What questions has VU Kumar asked of his MD, Chin Kwai Fatt, on the signing of a false declaration on the annual returns for PricewaterhouseCoopers Consulting Sdn Bhd (464379-U) for 2008, when Chin Kwai Fatt signed off that PricewaterhouseCoopers Consulting Sdn Bhd (464379-U) can meet its liabilities as and when they fall due, without disclosing the several hundred million Ringgit in contingent liabilities held by that company, and without also showing how PricewaterhouseCoopers Consulting Sdn Bhd (464379-U) can meets it's cash flow and balance sheet solvency tests? 7. What questions has VU Kumar asked of his fellow senior partner in PwC, Mr Khoo Chuan Keat, when he signed off for 2009 that PricewaterhouseCoopers Consulting Sdn Bhd (464379-U) can meet its liabilities as and when they fall due, without disclosing the several hundred million Ringgit in contingent liabilities held by that company, and without also showing how PricewaterhouseCoopers Consulting Sdn Bhd (464379-U) can meets it's cash flow and balance sheet solvency tests? 9. 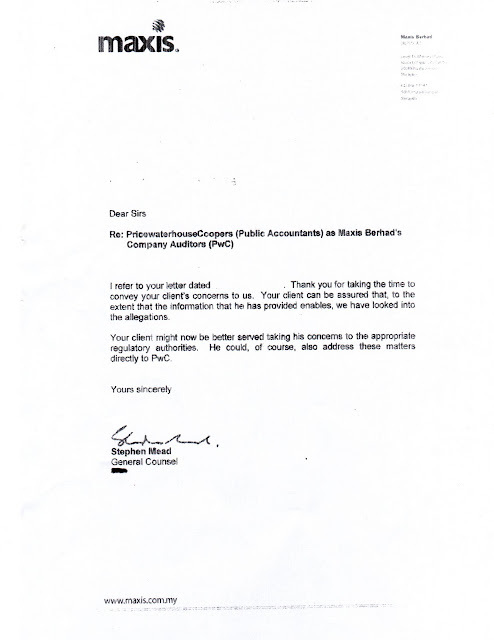 Can VU Kumar explain how the firm of PricewaterhouseCoopers (PwC) and Mr Cho Choo Meng of that same firm, registered by the AOB on the 1st of April, under Section 31s (1) SCA,when the board members themselves were only appointed on that very same day? 10. How does VU Kumar explain the appointment of a senior partner of PwC, as the Director of the AOB (Audit Oversight Board) which approved the registration of PwC as an auditor of PIE's (Public Interest Entities) like Maxis, when the registration was approved in a manner which is a legal and physical impossibility? 11. How does VU Kumar explain how the registration was approved on the 1st of April, 2010, when the law that allows PwC to pay for the registration was only approved on the 15th of April, 2010? Mr VU Kumar is not only the signing partner for Maxis, but also part of the disciplinary committee for the MIA, who are one of the regulators for auditors in this country, and if he will not answer any of the questions you put to him Mr Stephen Mead, will the minority shareholders in Maxis be expected to accept that PwC will remain as the auditors for Maxis, and that they meet the 'fit and proper' criteria that most other audit firms registered under the AOB have met in the correct and lawful manner? Can the minority shareholders of Maxis accept the findings of PwC's audit reports, when PwC can keep the fraud involving PricewaterhouseCoopers Consulting Sdn Bhd (464379-U) running for more than 9 years in order to hide several hundred million Ringgit in contingent liabilities, and even the regulators are letting the fraud slide? Johan Raslan: Do you have a conscience? Whither Corporate Governance in Malaysia? Audit Oversight Board sleight of hand.